Noah Reyes advanced to the finals at no. 6 singles and was named a Second Team All-American. 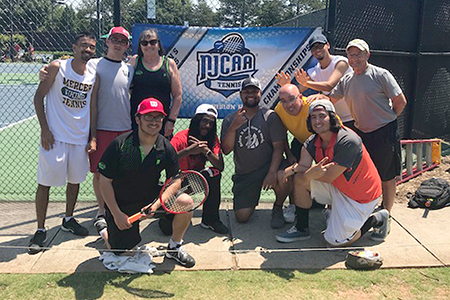 West Windsor, N.J. – The Mercer County Community College (MCCC) men’s tennis team returned from the National Junior College Athletic Association (NJCAA) Div. III championship a satisfied group in more than one way. With a fourth place finish out of nine teams, the Vikings ended their season just two notches back from their second place national finish in 2016. The tournament was held in Peachtree, Ga., May 11 to 13. Leading the pack was Vikings’ sophomore Noah Reyes, who was seeded second at no. 6 singles. In what Head Coach Marc Vecchiolla described as “the match of the day,” Reyes battled for 3-1/2 hours to win in the semifinal round. He lost in the final to Oxford College, which won in every flight. Reyes was named a Second Team All-American. 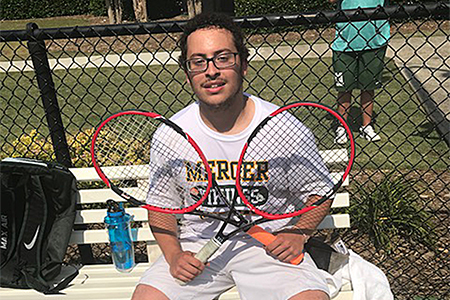 The road ended in the semifinals for several other MCCC players: freshman James Bueno, who was seeded second at no. 3 singles; Bennett Sherr at no. 5 singles; and Reyes and Greg Del Favero at no. 3 doubles, who went on to win their backdraw final. Oxford College (Ga.) finished the tournament with 36 points, followed by Rowan College at Gloucester with 22 points, and Nassau Community College (NY) with 17 points. Mercer earned 10 points. The full roster at nationals included: Xavier Shuda at no. 1 singles; Seven McGlotten-Bonds at no. 2 singles; Del Favero at no. 4 singles; Shuda and Bueno at no. 1 doubles; and McGlotten-Bonds and Sherr at no. 2 doubles. The alternates were Shub Sharma and Aaron Burt. Vecchiolla says that these players were not only dedicated to improving their game each and every match, but they were also dedicated to each other as teammates. He notes that while the 2018 squad had no “superstars,” all the players were all solid on the court. And, they proved that hard work pays off, a lesson they have used in tennis and will use in life. “Some of the guys were not highly competitive about tennis before joining the team,” Vecchiolla said, noting the vast improvement he saw from last year’s all-freshmen squad to this group of seasoned sophomores and enthusiastic freshmen ready to take their games to the next level. The Vikings earned their trip to nationals by finishing second after Rowan College in the Region 19 Tournament, held at the Mercer County Tennis Center May 4 to 6. Vecchiolla completes his 11th season as head coach for men’s tennis and completed his 21st season as head coach for women’s tennis in the fall. Under Vecchiolla’s leadership, the men’s team has advanced to the NJCAA Division III Championship seven times. On the women’s side, the team has won the NJCAA Division III title four times and placed second four times.